A brushless DC electric motor – or BLDC or BL motor – also known as a an electronically commutated motor – or ECM or EC motor – has permanent magnets which rotate on the rotor and a fixed stator with wound armatures. The BLDC is electronically controlled, which replaces the brush/commutator assembly of brushed DC motors, thus giving us a brushless DC electric motor. 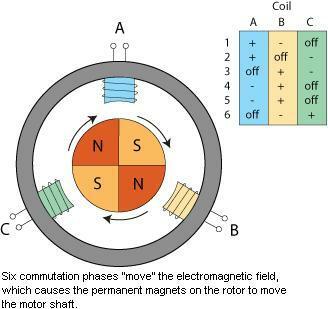 As you can see in the image above, the permanent magnet will rotate upon the rotor, causing the magnetic field experienced on the windings to reverse. As we know, this reversal of magnetic fields is what is necessary for the electromagnetic effect. The simple diagram below shows the motor in action. This video is actually really great at explaining the whole brushless DC motor, so take a view! Now, since this is a motor, the engineer in us must think how can we control this motor. You’ll notice on the second diagram, there is electronically controlled field coils. The first diagram refers them to windings. This is one and the same. You see, just as a alternating magnetic field (rotating magnet) can induce an electric current in the coils of a generator configuration, in the motor configuration, an electric current can be applied to the coils to align the permanent magnets. So, lets say we do an experiment where we take one magnet, and one electrically charged coil. If we slowly wave that coil around the magnet, we will see it move! Now, imagine we take a few coils, arrange them in a circle, and alternate the DC electricity to each coil in rotational sequence (clockwise or counter-clockwise). What you’ll begin to do, if enough current is applied to the coils to have an effect on the magnet, is align the magnet to the current applied! Depending on the configuration, various sequences can be used. For a simple 3 coil configuration, you can see the six phases of current being supplied to the coils in the diagram below. Either the charged coils are attracting the magnets, or repelling it. Because this motor is brushless, meaning there is no contact between the rotor and the stator, there needs to be sensors involved to allow the intelligence (usually a microcontroller) to know where the rotor is located. This ensures the current phase is known, and thus the next phase is also known to turn the motor in the desired direction. However, there is such a thing as a sensorless motor, which uses back electromotive force (EMF) from the the magnets on the coils to detect the position. Thought the brushless DC motor is a bit more expensive than the brushed DC motor, there are many advantages. The most obvious advantage is the fact that there is no friction caused by the brushes, thus it reduces a LOT of the heat in the motor, it reduces the wear of the motor, which then allows the motor to continue, un-maintained, for a very long time. Because the is no mechanical commutator – it’s commutation is electronic – the BLDC also doesn’t cause any electromagnetic interference (EMI). This is a good thing because EMI can cause a LOT of things to go wrong. 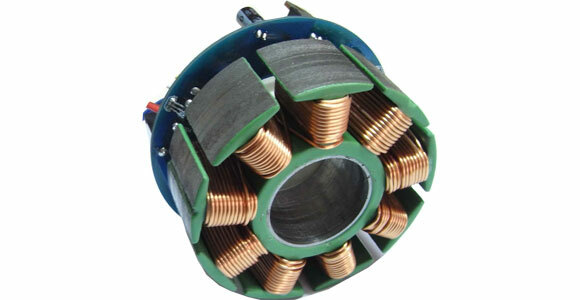 There are two types of brushless DC motors. The first is the sensor based, Hall-effect BLDC motor. The second is the sensorless back-EMF (BEMF) motor. First, if the motor is going to be operated in high temperature situations, this might render the sensors useless, so make sure to check this if it’s going to be an issue – typically for Hall-effect sensors. No sensors means less wires. Because the sensorless BLDC motors use phase canceling techniques, it might be smarter to use the sensored BLDC motors for applications that require varying speeds. This is because if your signal is constantly changing, if there is any delay between the two phases it might cause errors in canceling, thus errors in position sensing. Sensored motors always know the position of the motors, no matter if it’s been turned off for a day, or running for a day. However, sensorless motors require some little bit of movement to detect the position, which is known as ‘rotor jitter’. This jitter would not be ideal in high-torque situations, so mind this. With all this in mind, using a sensor ensures you know exactly what your motor position is at all times, ensuring accuracy. If you’re working in sensitive areas where very little error is allowed, get the sensor! So, do you have an interesting BLDC project?! I’d love to showcase it! What happens if I use a brushless motor as a generator? By transmitting mechanical energy to the shaft the magnets rotate and in the coils some current should flow, even if pulsating. Manlio, that is correct. The motor constant Kv is all you need. Once you know the rpm then you know the voltage or vice versa. This means you need to find the Kv graph or table for your motor.